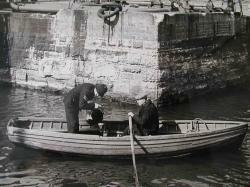 Barry Docks On the 5th July 1889 Barry Docks began business with the opening of No. 1 Dock. As with other ports along the South Wales coast, it was the export of Welsh coal that brought about this development and it was a successful venture from the start particularly once No. 2 Dock and the Low Water Entrance opened in 1898. 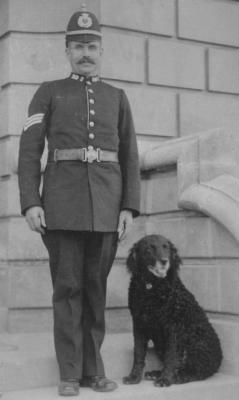 The Barry Dock Police and Pc Guy Franks The Barry Dock Police Force was formed at the same time and one of its original members was Pc Guy Franks who joined on the 10th July 1889, the same week that the docks began trading. Guy Franks was promoted to sergeant on the 28th January 1895 and he died in March 1925 at the age of 63 whilst still a serving officer. A very large contingent of Glamorgan Constabulary and GWR Police officers formed a parade at his funeral. The Tale of George McGough In 1900 the collier Rustington, loaded coal at Cardiff before calling at Barry Docks to take on extra crew. Amongst them were 39 year old John Dwyer from Thompson Street, his brother-in-law, William Burnett and 27 year old George McGough, a resident of Barry but a native of Duncannon in Scotland. On the 25th January 1900, the Rustington sailed for Santos in Brazil. During unloading operations in the South American port on the 9th of March, an argument broke out and led to McGough seizing hold of Dwyer and throwing him into the hold. The unfortunate crewman landed on his head and received such injuries that he died almost immediately. The incident was witnessed by four other members of the crew and McGough was taken into custody. McGough and the four crewmen were brought back to Southampton on the Royal Mail Steamship Company ship Magdalena, having been handed over to the Captain by the British Consul in Santos. On arrival at Southampton, McGough was arrested by Detective Sergeant Tribe and stood trial at Winchester during the Hampshire Summer Assizes in May the same year. A charge of wilful murder was reduced to manslaughter and despite claiming that the incident was an accident, McGough, who was reportedly very drunk at the time, was convicted of the manslaughter of John Dwyer and was sentenced to 15 months hard labour. Subsequently, there are numerous records to show that McGough returned to sea after serving his sentence, particularly on crew lists for entry into ports in the United States well into the 1920s. He was a man with a strong instinct for survival was George McGough, because records also show that he was almost certainly a surviving member of the crew aboard the RMS Titanic on its fatal maiden voyage in 1912. I am grateful to Hugh McGough for permission to use material from his extensive research. See http://www.magoo.com/hugh/george.html. Pc William Rowlands On the 8th of May 1959 Pc William ‘Bill’ Rowlands performed his last tour of duty at Barry Docks after thirty-nine dedicated years of service. One of the people who gathered at the police station to say farewell that day was fifteen year old schoolboy, Donald Prince who presented the retiring officer with a cigarette lighter. The last time these two had met had been twelve years previously when Pc Rowlands fished the inert body of three year old Donald out of the dock. On the quayside and throughout the ambulance journey to Barry Hospital Bill Rowlands worked tirelessly to revive the lad with artificial respiration. The boy was still unconscious when they reached the hospital and appeared lost. But the doctors continued to fight for his life and eventually they succeeded but they were in no doubt that they were only able to do so because of the unstinting effort made by Bill Rowlands. The officer was awarded a Certificate for Meritorious First Aid and a Bronze Medal. The fact that young Donald Prince was able to visit the police station at all that day to make that small gesture was testimony to the years of unwavering service of men like Bill Rowlands. Like many of his colleagues, his retirement did not make headlines in the local paper but his professionalism and steadfastness over half a lifetime spoke very highly indeed about such men..
Eric Young and the US Army From 1942 the U.S army used Barry Docks as a major port through which to bring service personnel and vast amounts of the equipment of war including tanks, artillery and landing craft. While Penarth Docks became a repair centre for the landing craft, a US army supply depot was established at Barry Docks which was to last for the best part of fifty years. And such was the relationship that developed between the US Army and the police at Barry Docks, that when Police Sergeant Eric Young retired in 1978, he had served at Barry Docks for twenty-two years, he was appointed an Honorary Sergeant in the United States Army and was presented with a signed certificate as proof of his rank. The Barry Dock Police force ceased to exist when it was taken over by the Great Western Railway Police in 1923 and who continued to provide the policing service until 1948 when the first national police force in Britain, the British Transport Commission Police was formed. Re-named the British Transport Police in 1963, the force continued the tradition until the dedicated police service was withdrawn from Barry Docks in 1985.